This is becoming a bad habit with me, but once again I mistook this novel for a fantasy novel instead of realistic fiction. Stupid, I know, but what can I do? I cannot say that I was glad when I found out my mistake - after all, fantasy happens to be one of my favorite genres, and contemporary romance one of my least - but this book was actually a pleasant read. It most closely resembled Love Letters to The Dead out of the books I have read before, but at the same time it was so very different. I would never have read this book knowing what the actual genre was, so I have to say that I am glad for my mistake. I loved Love Letters to the Dead because it was the first truly painful book I had ever read. 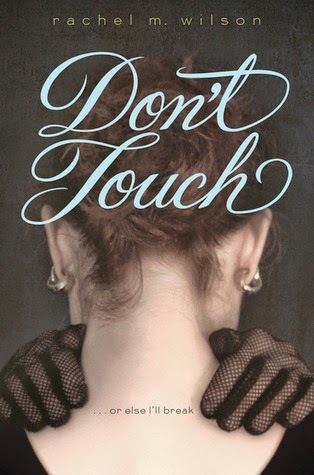 Don't Touch is painful as well, but much less so, which makes it a lighter read, and a quick one at that. One of the best aspects of this book has to be Peter. I do not usually go for the nice guys, but in this case, Peter was just right (as in he was not too hot but not too not-hot either). He was not self-righteous and he did not easily become annoyed with Caddie and her "problem"; instead, he was more helpful than most. Sure, he got frustrated several times, but he was never outright mean, and it was easy to see where his anger came from on the rare times he contained any. Friendship is an important part of this novel, and it was amazing getting to know everyone. At first, I assumed that all of Caddie's actor friends were not actually friends at all, but more like the popular clique everyone wants to be a part of in high school. Everyone just seemed petty and shallow. The more I read on, however, the more I realized that there was more to these people than I had suspected. I really enjoyed reading about the ups and downs Caddie went through with her friends, and it made me wish for friends that I could tell anything to, knowing that I would not be judged. It was also interesting watching Caddie's best friend look within herself and figure out how to truly grasp the truth of who she is. This story is an emotional one, not overly dramatic, but real. I will not lie and say that this is a book that will forever mean something to me, or that it has given me a new appreciation for the genre. Books about mental illness still are not my thing, but the things I learned while reading this novel are priceless, as are the thoughts that ran through my head during it. Anyone who is a fan of such books should definitely pick this up as it really gets to the heart of family, friends, and the thoughts you do not want anyone to know. This was an interesting book, and though it was not what I was looking for, it definitely opened my eyes a little wider to the realities of this world we live in. Book Synopsis: A powerful story of a girl who is afraid to touch another person’s skin, until the boy auditioning for Hamlet opposite her Ophelia gives her a reason to overcome her fears. Caddie can’t stop thinking that if she keeps from touching another person’s skin, her parents might get back together... which is why she wears full-length gloves to school and covers every inch of her skin. It seems harmless at first, but Caddie’s obsession soon threatens her ambitions as an actress. She desperately wants to play Ophelia in her school’s production of Hamlet. But that would mean touching Peter, who’s auditioning for the title role—and kissing him. Part of Caddie would love nothing more than to kiss Peter—but the other part isn't sure she's brave enough to let herself fall. Perfect for fans of Laurie Halse Anderson, this debut novel from Rachel M. Wilson is a moving story of a talented girl who's fighting an increasingly severe anxiety disorder, and the friends and family who stand by her.